Along with neighbouring and mainly Albanian-inhabited Kosovo, it has a Muslim majority - a legacy of its centuries of Ottoman rule. During the Nato bombing of Yugoslavia in 1999, nearly 500,000 ethnic Albanian refugees from Kosovo spilled over the border, imposing a huge burden on Albania's already fragile economy. While there have been signs of economic progress with inflation under tighter control and some growth, the country remains one of the poorest in Europe outside the former Soviet Union. Unemployment remains stubbornly high, and the infrastructure and corruption continue to deter much foreign investment. Agriculture, an important sector, still suffers from underfunding. Albania made a formal application for membership of the European Union in 2009, on the basis of a 2006 Stabilisation and Association agreement. The EU is keen to encourage further reform, particularly as regards stamping out organised crime and corruption and developing media freedom and property and minority rights. There were violent protests in Tirana in early 2011 against alleged kickbacks in a power station deal and vote-rigging in the 2009 parliamentary election. Four demonstrators were killed in clashes with police. A research scientist and senior member of Prime Minister Berisha's Democratic Party, Mr Topi was elected president for a five-year term by parliament in July 2007. Albanian is a parliamentary republic, and executive power resides with the cabinet of ministers. 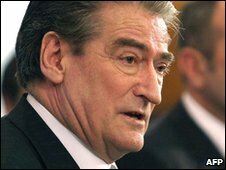 The centre-right Democratic Party led by the former president, Sali Berisha, was re-elected by a narrow margin in parliamentary elections in July 2009, defeating the main opposition Socialists. The election count, which produced the closest result since Albania toppled communism in 1990, was accompanied by disputes over procedure and claims of intimidation. The Socialists refused to recognise the election result, and began a campaign of mass protests and civil disobedience in support of demands for a partial recount. Mr Berisha first became prime minister following victory in general elections in July 2005. That vote was also followed by wrangling over the count, with re-runs demanded in a number of constituencies. It was nearly two months before the result was finally declared. An erstwhile communist, Mr Berisha formed the Democratic Party in the early 1990s and in 1992 became Albania's first non-communist president since the Second World War. His bid to liberalise the economy fast increased hardship for the majority. His presidency came to an end in 1997 when the collapse of fraudulent pyramid investment schemes led to violent unrest. As prime minister, Mr Berisha promised to stamp out corruption, reduce taxation, attract greater foreign investment and develop the infrastructure. He succeeded in gaining Albania Nato membership in April 2009, and the country formally applied for European Union membership the same month after a June 2006 Stabilisation and Association agreement. Born in 1944 and a former heart specialist, Mr Berisha is known as an orator and has faced accusations of authoritarianism in the past. Public broadcaster Albanian Radio and TV (RTSh) operates national radio and TV networks. It faces competition from private stations, which have mushroomed since the late 1990s. Many viewers watch Italian and Greek TV via terrestrial reception. The BBC (103.9 MHz in Tirana), Deutsche Welle, Radio France Internationale and the Voice of America are carried on FM. Sensationalism is often the norm in the print media. There are some 150 newspaper titles, including 23 dailies. Political parties publish their own titles. The constitution guarantees free expression, but the "intermingling of powerful business, political, and media interests" has inhibited the development of independent outlets, said US-based Freedom House in 2010. Reporters are subject to legal pressure, and in some cases physical attacks, it added. 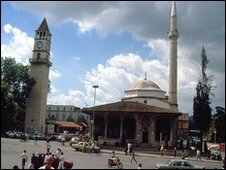 Some 1.3 million Albanians were online by June 2010 (InternetWorldStats.com).